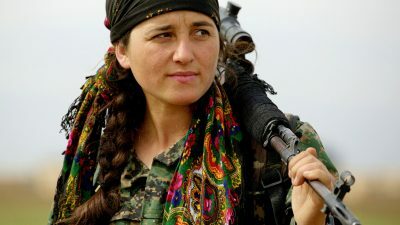 Patrick Huff, Amber Huff and Salima Tasdemir reflect on the future of the revolution in Rojava after the fall of Afrin. In the wake of the capture of Afrin City by Turkish ground troops and jihadist auxiliaries, came news of the death of Anna Campbell. Called Daisy by some friends and Helîn by others, Anna, along with several of her Kurdish comrades, was killed by a Turkish airstrike in Afrin. As a British volunteer in the Women’s Protection Units (YPJ), she had seen combat against ISIS and when Turkey launched its invasion she volunteered to fight alongside her comrades in defense of the people of Afrin. 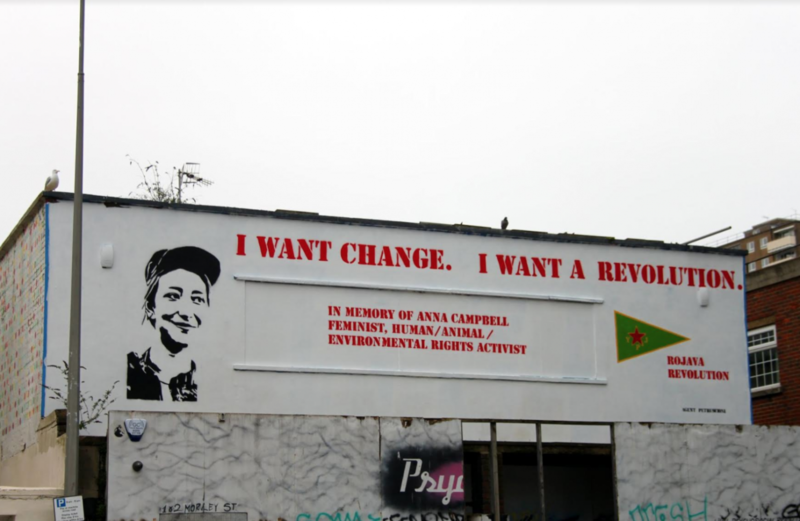 Activists across the UK mourn the loss of a gentle and courageous friend and Anna’s family members, though deeply grieved, have expressed pride and support for her decision to defend women’s revolution in Rojava. 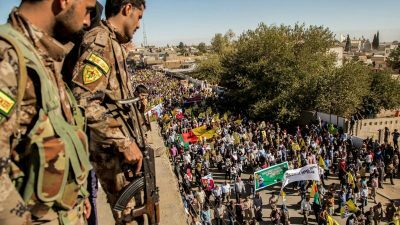 At the same time, Kurds and allied solidarity groups have taken to the streets almost daily with massive demonstrations, protests, and direct actions across Europe, North America and around the world. On 24th March, London saw thousands march to Parliament Square for World Afrin Day, calling on the British government to help stop Turkey’s aggression against the people of Afrin and to negotiate a ceasefire in order for Campbell’s body to be retrieved and repatriated to the UK. Currently the United Nations estimates about 75,000 of the 100,000 Afrin refugees have taken shelter in the town of Tal Rifaat. Turkish forces, under the threadbare pretexts of uprooting terrorists, are advancing on this traumatized population. The coming attack will only exacerbate an already calamitous humanitarian situation. A prime beneficiary of Turkey’s belligerence in Afrin will be ISIS. As reports suggest, with its strongest and primary enemies distracted, the group is gaining a dangerous second wind. Turkish President Recep Tayyip Erdoğan’s aims for a complete occupation and colonization of a ‘cleansed’ northern Syria have been made increasingly clear. All this appears to be part of his increasingly transparent Neo-Ottoman imperial ambitions. A feedback loop between Erdoğan’s entrenchment of domestic power and his belligerent foreign policy seems to be at play, one amplifying the other in a vicious and dangerous cycle. Those in Turkey who bravely spoke out against the state’s invasion of Afrin have been met with heavy-handed repression. At least six hundred people have been jailed for opposing the war on Afrin since it began. Hundreds of detained dissidents have been charged with supporting terrorism by attending anti-war protests and spreading ‘terrorist propaganda’ on social media. Those prosecuted include eleven senior members of the Turkish Medical Association because the organization issued a statement critical of the war. As with many world leaders, for Erdoğan ‘terrorism’ acts as a magical word authorizing any act of aggression, no matter how ill conceived or deadly. Not content to stop with Afrin, Erdoğan has threatened in recent weeks to extend his invasion to all of Rojava and even into the Kurdish autonomous areas of Northern Iraq’s Sinjar region. Ostensibly the aim is to strike at the blacklisted Kurdistan Workers’ Party (PKK). The PKK has announced a withdrawal from Sinjar to avoid unnecessary bloodshed. For already brutalized Yazidis, members of a minority ethno-religious group who live in this area, the prospects of Turkish backed Jihadists entering the region is especially terrifying. In 2014 ISIS marked Sinjar’s Yazidis for extermination. Abandoned by the Kurdistan Regional Government (KRG) in Iraq and the central government in Baghdad, an eleventh hour intervention by PKK and YPG and YPJ militias saved thousands of Yazidis from certain death. Since this time Turkey has launched air strikes repeatedly in the region. In a disturbing twist, it now appears Erdoğan plans to use Syrian refugees as pawns in his colonial designs. To affect a demographic shift, to ‘de-Kurdify’ the region, resettlement plans are underway in Afrin. Turkey announced the formation of an administrative council for Afrin. To provide the unelected officials with a modicum of legitimacy the council is reportedly composed of Arabs, Kurds, Christian and others willing to collaborate with the regime. This apparent diversity belies the council’s singular dependency on the force of Turkish occupation for its authority. 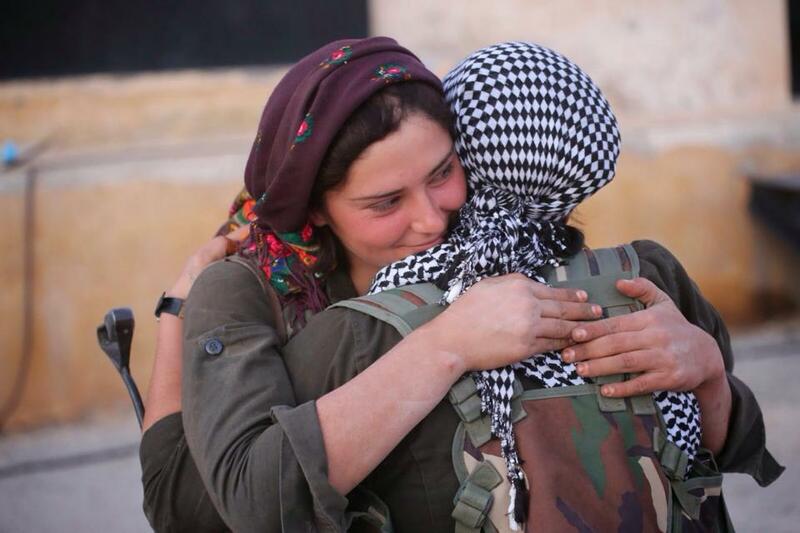 Kurds have come to call the Syrian conflict the Third World War. There are at least two (not mutually exclusive) ways to interpret this. In the first, quite simply, the conflict has drawn into its orbit all the major regional powers as well as all the major global powers. Syria has thus become a crucible and proxy terrain for playing out of local, regional, and global political rivalries. The second interpretation is more revealing: the struggle in Syria is fundamentally one between two competing, starkly different visions of the future. Long ago in another era of global conflict, rapid change, and facing an unpredictable future, Antonio Gramsci purportedly observed that, ‘The old world is dying, and the new world struggles to be born: now is the time of monsters.’ Turkey’s resurgent statist nationalism, Erdoğan’s strongman posturing, and his project of a renewed Ottoman Caliphate perfectly represent the wider authoritarian turn in the global political order. 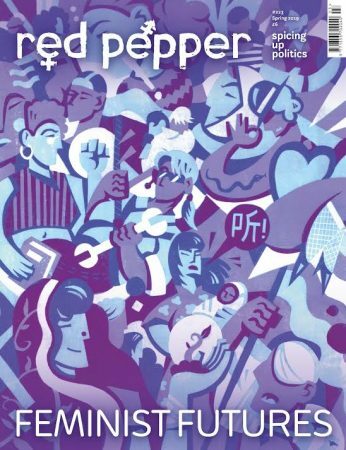 In contrast, Rojava’s revolutionary model of Democratic Confederalism, a non-state social paradigm grounded in the principles of women’s liberation, communalist direct democracy, and ecological sensitivity, exemplifies the widening cracks in the façade of Empire. Why is Turkey targeting Afrin? 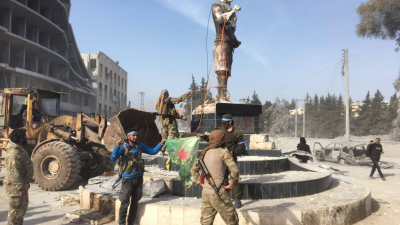 Pinar Dinc and Kamran Matin explain what Erdogan, Iran and Russia have to gain from a bloody war on Afrin's restive Kurdish population.